Northwest of Diocletian's Palace and on the southern slope of Marjan Hill is the Veli Varos neighbourhood, originally founded by farmhands and fishermen beginning in the late 17th century. 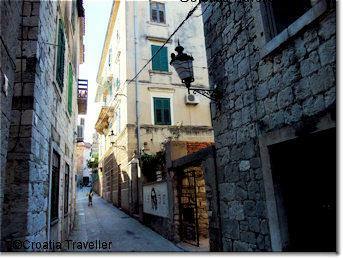 A maze of pedestrian streets wind around several significant churches and up Marjan Hill. Look for the traditional peasant housing that consists of a closed courtyard, stable and wine cellar on the ground floor and an exterior staircase leading to the housing area on the first floor. It's a pleasant area to wander and easy to become lost! Note the Pre-Romanesque Church of St Nicholas (sv Mikula) built in the 11th century up on M. On the western facade there is a portal with lionesses and the names of citizen Ivan and his wife Tiha erected in 12th-century Romanesque style. The massive bell tower dates from the 17th century. On ulica Sv Kriza is the parish Church of St Cross (sv Kriz) built in 1681 to replace an earlier church. The bulb-like cupola on top of the baroque bell tower makes the church easy to spot. The Franciscan Monastery and Church of St Frances (sv Frane) near the seaside is notable for the tombs of famous Split residents such as the writer Marko Marulic, the composer Ivan Lukacic, and the politician Dr Ante Trumbic whose sarcophagus was made by the famous Croatian sculptor Ivan Mestrovic. There are a few hotels and an impressive number of houses offering private accommodation in Veli Varos. There is, however, very little parking on the narrow streets, many of which are pedestrian only.